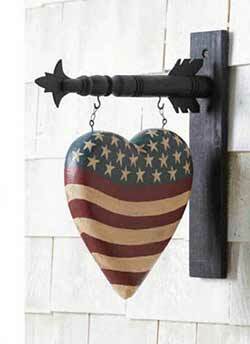 Framed Pictures, Wreaths, K & K Arrow Replacements, Barn Stars and more in stars and stripes inspired designs for your patriotic decor! 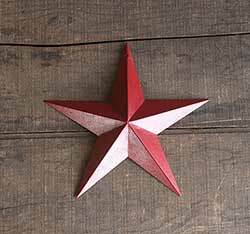 Accent your wall with a touch of primitive Americana with this colonial inspired barn star, in the 12 inch size! 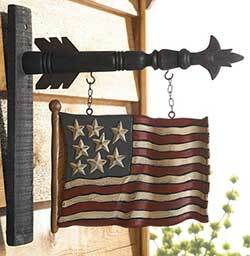 Accent your wall with a touch of primitive Americana with this colonial inspired barn star, in the 18 inch size! 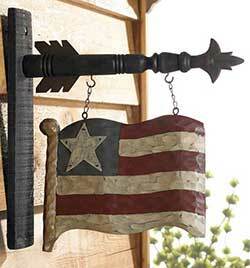 Accent your wall with a touch of primitive Americana with this colonial inspired barn star, in the 24 inch size! 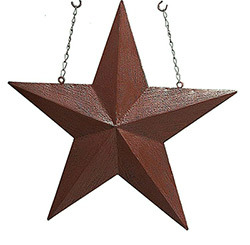 Accent your wall with a touch of primitive Americana with this colonial inspired barn star, in the 36 inch size! 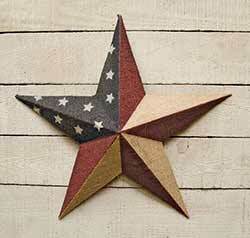 Accent your wall with a touch of primitive Americana with this colonial inspired barn star, in the 48 inch size! 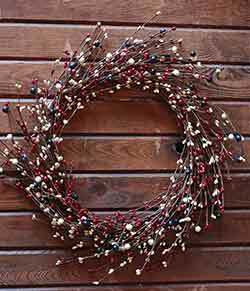 Americana Berry Wreath - Add patriotic color and texture to your wall, door, or table with this red white and blue berry wreath! 16 inch (10 inch inner diameter). 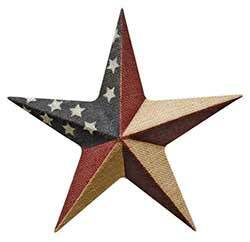 Americana Star Wreath - Show your patriotic spirit with this festive star wreath! 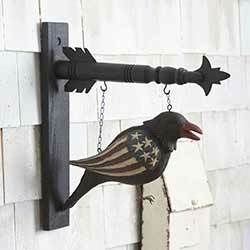 Features tin stars and resin pip berries in red, white and blue, all tucked in to a sturdy grapevine twig base. SPECIAL ORDER. 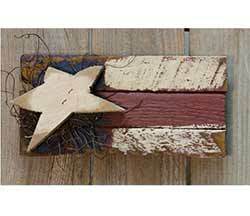 Make a patriotic statement on your wall or door with this beautiful colonial style barn star, featuring a rustic Americana design printed on burlap and affixed to the star. 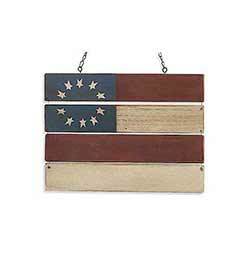 Perfect for a vertical wall space, this tea dyed banner features a colonial inspired patriotic look, and "1776" image. Measures 34 inches long. 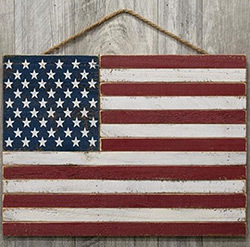 Home Sweet Home Patriotic Sign, by The Hearthside Collection. 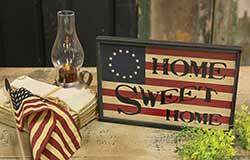 This decorative wooden sign features a Betsy Ross inspired colonial flag design, and reads "Home Sweet Home." 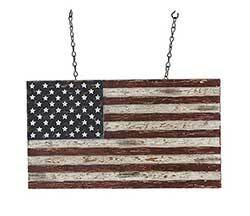 This rustic, slatted wood wall hanger brings a primitive design take on the American flag! Measures approx 24 inches. 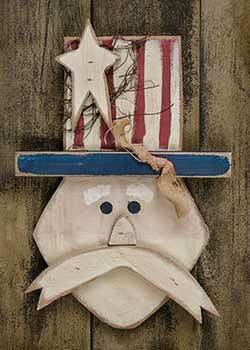 This rustic, slatted wood Uncle Sam has a dimensional mustache and hat, and his body is painted in red, white, and blue. 16 x 10 inches. My Brother is a Hero Stitchery, by Primitives by Kathy. Hand-stitched, framed under glass. A Lisa Johnson design. Measures 11 x 5.5 inches. Fabric, wood frame, glass. Others also available! 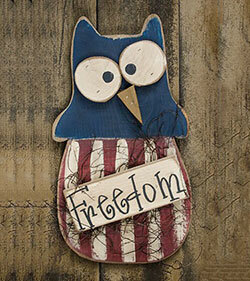 Painted in a stars and stripes motif, this primitive wooden owl will add patriotic charm to your front door, entryway, or wall space in your home! 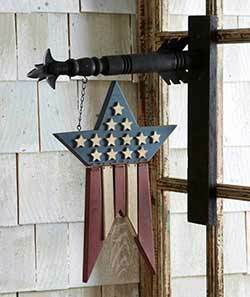 Patriotic Pip Berry Wreath with Rusty Stars - Add country color and texture to your wall, door, or table with this pip berry wreath! 16 inches. 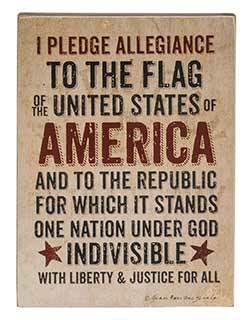 Decorate a shelf or wall with a touch of American pride with this box sign featuring the Pledge of Allegiance. 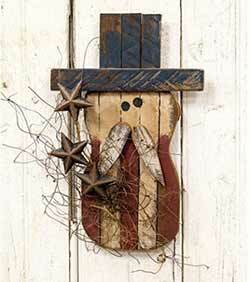 This primitive wooden Sam will add patriotic charm to your front door, entryway, or wall space in your home! 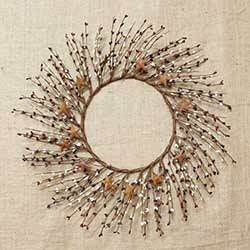 Made of painted and distressed wood accented with angel vine and burlap. 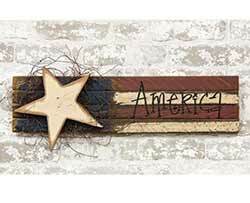 erfect for a small wall space, this small American flag sign is made of painted and distressed wood accented with angel vine and wire. 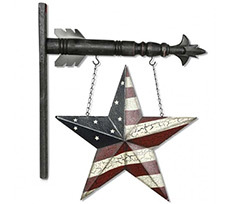 Available in a wide variety of designs, these best-selling arrow sets are a wonderful and unique accent to your home! 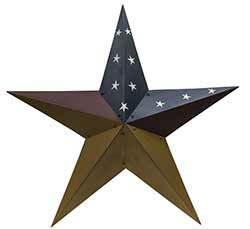 This is for the Star Replacement piece only (Black arrow hanger sold separately). 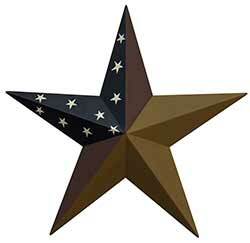 Star measures 15 x 15 inches.